James Morgan was not the most famous of canal engineers. Little is known about his long life in the shadow of more famous men. No painting or drawing of Morgan is thought to have survived. The major work of his life was the Regent's Canal, and the greatest engineering feature of the canal is Islington Tunnel, designed and built by Morgan, and completed in 1818. 185 years on the tunnel is still in use and has had few maintenance problems over the years - a testament to Morgan's work. Morgan was born in 1776 or thereabouts, most probably in Carmarthen, in south Wales. We know nothing of his parents or childhood but as a young man he was employed, in Carmarthen, as an assistant to the architect John Nash who was at that time in practice in the town. John Nash was an architect from London who had family connections in Wales. In 1783, Nash was made bankrupt and left London for Carmarthen where he somehow managed to re-establish himself in practice. He was noted for Carmarthen Jail and other prisons and gradually his practice prospered. We do not know for sure when Morgan entered Nash's employment or how they met but it may have been through family connections or through a newspaper advertisement. Morgan probably joined Nash's practice as a draughtsman, when he was around 20 years old. He was to remain a close associate of Nash for over forty years. 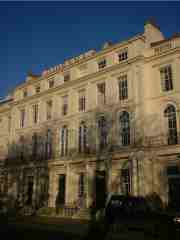 On 22nd August 1806 John Nash and James Morgan were appointed Architects to the Department of Woods and Forests, a Government Ministry. Nash was undoubtedly the senior of the two and his annual salary of £200 was also to cover Morgan's salary. A boring job it may have been, but Nash almost certainly foresaw the greater things to which it might lead. We do not know when Morgan moved to London but it must have been for the purpose of their continued partnership. In 1811 a lease on part of the Crown Estate, Marylebone Farm, was due to expire. The land would become available for the Crown to develop. The Commissioners of Woods and Forests had their architects draw up a plan for the future which Nash produced in 1811. It was a bold plan for a new park for gracious living for London's elite, and a major redesign of part of central London to accommodate a route from the park to Westminster. The story of Regent's Park, as this project became, belongs elsewhere, but it is worth noting that whilst the credit for it rightly belongs to Nash, it was Morgan who supervised the work of planting, road making, and laying out the park, including the lake, under Nash's direction. designed by Morgan In 1811 Thomas Homer, who was promoting the idea of a "London Canal", made contact with John Nash. Nash and Morgan reviewed the route proposed by Homer and Nash soon became a driving force for the canal. Nash had by this time become an associate of the Prince Regent who, from 1811 to 1830, exercised the Monarch's functions during the insanity of King George III. Morgan was responsible for drafting the plans for the canal, which, by consent of the Prince, became known as the Regent's Canal. Morgan's plan of September 1811 was the basis of the Regent's Canal Bill which was, after a stormy passage through Parliament, passed in July 1812. Nash was a large shareholder in the canal company and his influence undoubtedly led to the appointment of Morgan as the company's Engineer. Morgan had no experience of canal building but his salary of £1000 per year. The building of the canal was not without it's fair share of troubles. Morgan wisely built Maida Hill tunnel before tackling the much longer Islington Tunnel. He only had the latter task because a competition for the tunnel's design resulted in no useful entries being received. To his credit, Morgan rose to the challenge of a work far greater than he was qualified to carry out. Maida Hill Tunnel had been beset with delay and an unexpected problem with a spring. Several workmen were lost in its construction. Another crisis was caused by the hydro-pneumatic lock installed at Hampstead Road. The inventor was William Congreve, famous as the father of rocketry and an equerry to the Prince Regent. Morgan recommended the lock and is blamed for a costly failure. However we must remember that the Board of Directors endorsed his view and it seems certain that Nash knew Congreve personally. They worked together on the celebrations of George I's Centenary and of the Treaty of Paris which ended years of war with the French. Congreve was a highly respected figure and it may not be fair, therefore, to blame Morgan for the decision to build the lock. In 1815 a landowner, William Agar, issued a writ against Morgan and others as part of a long running legal battle which Agar had waged against the canal. In June a July found against him and awarded damages to Agar of £500. The building of Islington Tunnel dominated Morgan's life from around that time until it was completed in 1818. Three quarters of a mile long, it was build with explosives and wheelbarrows and horses and manual labour. In 1818 the eminent engineer Thomas Telford was asked to report on the tunnel. He reported: "materials and workmanship excellent, and its direction perfectly straight". The opening of the canal on 1st August 1820 was perhaps Morgan's finest hour as he travelled on the leading barge of a grand procession from St. Pancras to the Thames. Engineers in the early 19th Century were not employed exclusively by a single company as might be expected today but were more like permanent consultants, working from home at least some of the time, and having the freedom to undertake other work if they so wished. The River Stour in Kent had long been a navigation in need of improvements when a committee was formed in 1824 to bring together various interests to bring about improvements. They appointed James Morgan to carry out a survey and write a report. Morgan proposed an ambitious scheme involving sections of new canal and improvements so that 100 ton barges could reach Canterbury. The Committee must have been impressed for they appointed Morgan as Chief Engineer. The Commissioners of Sewers raised concerns about the drainage aspects of the plan and once again we find Thomas Telford being called in to give a second opinion on Morgan's work. Once again Telford supported Morgan and endorsed the plan. In 1825 Canterbury saw celebrations, as an Act of Parliament was passed to authorise the work to go ahead. Unfortunately however the tenders for the work were more than had been expected - a familiar story. A number of London based shareholders refused to support the continuation of the scheme. They doubtless had in mind proposals for a new railway to Canterbury which would have competed with the navigation. In 1827 a general meeting of the company which had been formed to build the navigation decided to postpone the work, which was never resurrected. The diorama lasted until 1848 when it was sold and became a Baptist chapel. Artistically successful it had not been a great success commercially. The Church Building Act 1818 provided a substantial amount of public money for the building of new Church of England churches. The industrial revolution was well under way and the changing distribution of population in the UK meant that there was a need for new churches in the growth areas. In addition, the country was anxious about revolutionary ideas from across the channel in France. The church building programme was about saving souls, thanking God for the country's deliverance from the war with Napoleon Bonepart, and fostering religion rather than revolution. The churches were known as "Commissioners Churches". 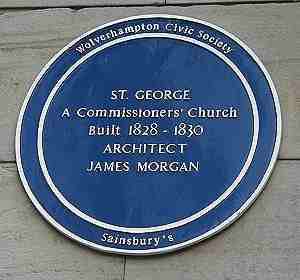 We do not know how many churches Morgan was involved in building. John Nash certainly built a few and it would seem likely that Morgan might have seized the opportunity to earn some fees from the extra building work on offer from the Commissioners. He is believed to have been responsible for St. George's Church, Wolverhampton, (right) completed in 1830. In 1827 we find him in Leamington helping Nash with a terrace of houses. 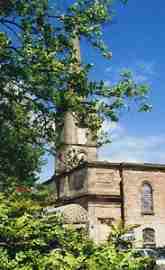 In 1830 he undertook alterations for Bushbury Church, Wolverhampton. After his resignation from the Regent's Canal in 1835 we hear nothing more of Morgan. However we do know that he died on 18th February 1856 at the age of 80. He was living in Hammersmith at that time. His wife Margaret died a year before him and they are buried together in London's Brompton Cemetery. The grave is a simple one, marked with a gravestone which is only partly legible today. Given his considerable age and the fact that he clearly was not a poor man in his old age (his will has not been fully transcribed but he has significant property to bequeath) we may assume that he retired. John Nash left a sum to Morgan in an early will, later changed due to financial circumstances, so we may assume that the two men were lifelong friends. He does not appear to have had any children who survived him. "Never for an instant does Morgan emerge as a personality, but he is always there. He is the backroom partner, the alter ego, the deputy, the agent, the man of straw, whichever character the master needs at the moment. His usefulness is inexhaustible and we shall meet him constantly though never face to face"
Morgan does not seem to have made much of a name for himself in his day but his works have stood the test of time. Whilst Nash, great man as he was, probably made the Regent's Canal happen, Morgan actually built it and his engineering works remain his monument. Morgan's Grave, in London's Brompton Cemetery.